Consumers are searching actively for properties in Dombivli in Thane. Using this as a benchmark, Magicbricks set out to figure what it is about this location that drives users. Affordability was the biggest driver. 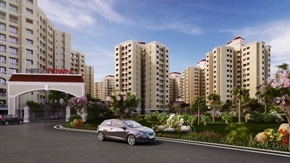 You can get a 1BHK in Dombivli for Rs 21-50 lakh, a 2BHK for Rs 31-85 lakh and a 3BHK for Rs 45 lakh – Rs 1.07 crore. This is significantly more affordable than Thane West where the average values are about Rs 10,500 per sq ft compared to Rs 5,980 per sq ft in Dombivli East and Rs 6,300 per sq ft in Domivli West. However, while social infrastructure such as schools, hospitals, entertainment and retail centres get a thumbs up from consumers, roads, traffic, cleanliness and parking was downvoted by consumers. Planned as part of the Kalyan Dombivli Municipal Corporation in 1983, it is a riverside location with the Ulhas river forming its boundaries and running across the city. With a large amount of new housing stock hitting the market, Dombivli is in favour with those working in Thane, a newly evolving business district and those working in Andheri or BKC, thanks to being well connected by rail. According to a survey on magicbricks.com, townships have been catching the fancy of users in Dombivli. There are at least three large townships in the Dombivli area – Runwal’s 156-acre MyCity, Marathon’s 14-acre NextTown and Lodha’s 4,500 acre Palava City. Participatory planning and management seems to be at the core of this new phase of premium middle-class, aspirational living. Palava is a Greenfield Smart City being built by the Lodha Group across an expanse of 4500 acres. Since it has the advantage of size and therefore scale, the city harnesses the waterfront very well and has invested in its maintenance as well as waterfront development. For sports lovers, there is a FIFA-standard football stadium (with a city team), multi-sport arena, cricket grounds and a 9-hole golf course. For the 25,000 citizens already living in 301 towers, there are schools, clubhouses, a mall and neighbourhood shopping and medical facilities. Ultimately, the consumer is willing to pay for a quality of life. No longer is buying a home just fulfilling a basic need. Home buying is aspirational and lifestyle, infrastructure, ease of commute, safety and quality of neighbourhood matters. The better the management of facilities the higher the demand for units and therefore, the better the rate of appreciation of values. Copyright © 2019 Newfriars. All Rights Reserved.